In 1993's "THE LAST ACTION HERO," Arnold Schwarzenegger abducts the corpse of a mobster (loaded with explosives) from a rooftop funeral, and escapes with the help of a glass elevator and a crane, only to plunge into the "La Brea Tar Pits." Those scenes were shot in, around, and on top of the Hyatt Hotel in Long Beach (200 S. Pine Avenue, off Ocean Boulevard). The real La Brea Tar Pits are 20 miles away, but for the movie, the Rainbow Lagoon (on the hotel's south side) was transformed into imitation "tar pits." In the 1993 thriller "POINT OF NO RETURN" (an American re-make of "La Femme Nikita"), assassin Bridget Fonda dresses as a maid and delivers a cart to a party at a posh hotel, then leaves. As she exits the building, a bomb (which was hidden in the cart) explodes, blowing up the entire top floor of the hotel. That hotel scene was shot at was the Hyatt Regency Hotel in Century City (2151 Avenue of the Stars), just south of the Fox Plaza Tower, near 20th Century Fox Studios. From that same movie, you can find the blue & white house where Bridget Fonda's character lived at 523 Ocean Front Walk (at Sunset Ave), in Venice, CA. Remember the scene in 1993's "INDECENT PROPOSAL" where real estate agent Demi Moore shows millionaire Robert Redford through an empty gothic mansion? That was shot inside the historic Greystone mansion, in Greystone Park (at 905 Loma Vista Drive, in Beverly Hills). Other movies filmed in and around the dramatic Doheny mansion and gardens of Greystone Park include "THE BIG LEBOWSKI" (1998), "GHOSTBUSTERS II" (1989), "THE WITCHES OF EASTWICK" (1987, with Cher, Michelle Pfeiffer, Susan Sarandon, & Jack Nicholson), "ALL OF ME" (1984, with Steve Martin & Lily Tomlin), "THE LOVED ONE" (1965), "THE DISORDERLY ORDERLY" (1964, with Jerry Lewis), "FOREVER AMBER" (1947), and "DYNASTY: THE MOVIE." Also in "INDECENT PROPOSAL," Demi Moore worked at a real estate office located in the landmark Crossroads of the World center, at 6671 Sunset Boulevard in Hollywood. 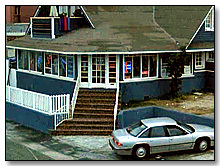 Crossroads was also the location for Danny DeVito's office in 1997's "L.A. CONFIDENTIAL."